Despite the country’s ongoing political conflict, many of the organizations and leaders that played key roles in last year’s upheaval, such as the military, the Muslim Brotherhood and the April 6 Movement, remain popular. While the military’s ratings may have dropped somewhat since 2011, a majority of Egyptians continues to hold a positive view of the military, the Supreme Council of Armed Forces (SCAF), and SCAF’s Chairman Mohamed Tantawi. 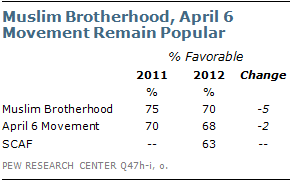 The Muslim Brotherhood also continues to be highly regarded. Opinions toward other religious groups and leaders, however, are mixed. The Freedom and Justice Party (FJP), the political party affiliated with the Muslim Brotherhood, and Abdel Moneim Aboul Fotouh, a moderate Islamist who broke with the Muslim Brotherhood to run for president, are slightly less well-reviewed. Egyptians are less favorable toward more conservative religious parties and leaders, such as al-Nour and Hazem Salah Abu Ismail. Amr Moussa, prior Secretary General of the Arab League and a former foreign minister under Mubarak, is the most popular among the political leaders asked about in the survey. Other secular leaders and groups do not fare as well. Mohamed ElBaradei, former head of the IAEA and an important figure in the protests against Mubarak, has dropped somewhat in favorability since 2011. The Egyptian Bloc, a coalition of liberal and secular political parties, is also rated negatively. Minister of Planning and International Cooperation Fayza Abul Naga, who was instrumental in the recent investigation of American non-governmental organizations operating in Egypt, receives poor ratings. Political institutions, such as the court system and the People’s Assembly, receive mostly positive reviews for their influence on the country. The local police, however, are generally viewed negatively. 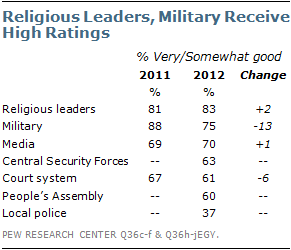 Religious leaders and the military continue to be the most highly-rated groups in Egypt. About eight-in-ten (83%) Egyptians say religious leaders have a very or somewhat good influence on the country, including 36% who say their influence is very good. Despite the considerable political turmoil that has surrounded the military over the past year, a broad majority (75%) of Egyptians continues to say it has a good influence, including 43% who say very good. While ratings for the military remain high, positive ratings have fallen by 13 points since 2011. The drop has been especially large among women and lower-income respondents. In 2011, 58% of women said the military’s influence was very good; today, only 38% say the same. 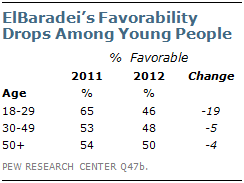 Among lower-income Egyptians, the change was from 69% saying very good in 2011 to 46% now. The media – such as television, radio, newspapers, and magazines – receives high marks from all sectors of Egyptian society, with 70% of the public expressing a positive assessment. Other institutions that do well are the court system, the People’s Assembly, and the Central Security Forces. The court system is rated positively by 61% of Egyptians, falling somewhat from 67% in 2011. Similarly, about six-in-ten believe the People’s Assembly (60%) and the Central Security Forces (63%), a national law enforcement organization, have a very or somewhat good influence. Opinions about the local police are much more negative. Just over a third (37%) of Egyptians views the local police as having a good influence, while a majority (62%) rates it as very or somewhat bad, including 35% who say very bad. The Muslim Brotherhood and April 6 Movement – two key groups involved in last year’s Tahrir Square demonstrations – continue to be viewed favorably, as they were right after the uprising in 2011. About seven-in-ten Egyptians rate both groups positively, including almost a third who give both groups a very favorable rating. The Supreme Council of the Armed Forces is also well-regarded by a majority, despite recent concerns that SCAF will not hand over power to a democratically-elected president next month. 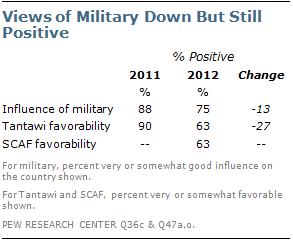 About six-in-ten (63%) Egyptians have a positive attitude toward SCAF, including 20% very favorable. Among the major political parties included on the survey, the Freedom and Justice Party and al-Wafd Party, a secular party which has held legal status since 1978, receive the highest ratings. The FJP is reviewed positively by 56% of Egyptians and 52% are favorable toward al-Wafd. Egyptians are divided on both al-Wasat Party, a group that broke away from the Muslim Brotherhood in the 1990’s, and al-Nour Party, the largest party associated with the conservative Salafists. Just under half (46%) rate al-Wasat positively and a similar percentage (48%) rates them negatively. Equal percentages (44%) are favorable and unfavorable toward al-Nour. The liberal, secular Egyptian Bloc is the least popular of the major political groups that hold seats in the People’s Assembly. About four-in-ten (38%) Egyptians hold favorable opinions of the Egyptian Bloc and nearly half (47%) are unfavorable. Egyptian Bloc. Despite this conflict at the elite level, the supporters of these various groups among the public do not exhibit the same level of polarization. Instead, people who are favorable toward one of these organizations tend to also view the other groups positively. For example, among those who rate the Egyptian Bloc favorably, over half also rate the FJP (54%) and SCAF (70%) positively. Among those who are favorable toward the FJP, 80% are favorable toward SCAF. And among SCAF supporters, 72% are positive toward the FJP. These patterns suggest the general public is not yet making strong distinctions between the leading political groups. Current presidential candidate Amr Moussa is very popular with the Egyptian public: 81% give him favorable ratings, down only slightly from 89% in 2011. Field Marshal Mohamed Tantawi is also well-regarded by a majority (63%) of Egyptians, although his favorability rating has fallen from last year’s 90%. The decline has been especially steep among women: 59% express a positive view of him now, compared with 92% a year ago. Ayman Nour, founder of the liberal al-Ghad party and a critic of SCAF, receives high marks from 61% of Egyptians. Similarly, about six-in-ten (58%) rate Abdel Moneim Aboul Fotouh positively. The public expresses less favorable opinions about both Hazem Salah Abu Ismail and Mohamed ElBaradei. Abu Ismail, a conservative Salafist presidential candidate who was recently disqualified from the race, receives favorable reviews from 52% of Egyptians and unfavorable reviews from 42%. 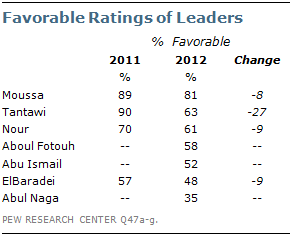 ElBaradei’s favorable ratings have slipped somewhat from 57% in 2011 to 48% today. Support for ElBaradei has dropped the most among younger people – his strongest supporters in 2011 (65% favorable) are now his weakest (46% favorable). Minister of Planning and International Cooperation Fayza Abul Naga is the least popular among the political leaders included on the survey. Just over a third (35%) of Egyptians are favorable toward Abul Naga, while half (50%) are unfavorable and 15% offer no opinion.